Hankey Law Office > Articles > Do You Need Long-Term Disability Insurance? Many people do not plan for the possibility of suffering from a long-term disability. Long-term disabilities, or LTDs, are illnesses or injuries that prevent individuals from working for at least a year. Frighteningly, the U.S. Census Bureau estimates that Americans have a one in five chance of suffering from an LTD. On average, these ailments keep individuals from working for about two and half years. If you become disabled, you can apply to receive long-term disability payments from the Social Security Administration. However, these applications are often denied. Instead, you may want to consider LTD insurance. If you need help in dealing with your long-term disability insurance provider, you should contact an experienced Indiana LTD lawyer from Hankey Law Office today at (800) 520-3633. Do you have family members and loved ones who rely on your steady income? Do you have debt that you must pay off (mortgage payments, car payments, etc.)? Do you work in a dangerous industry? If you answered yes to any of these questions, you should think about your options for LTD coverage, including LTD insurance. Unfortunately, LTD insurance companies do not always provide the benefits that customers deserve. If you believe that your long-term disability insurance provider has wrongfully denied your claim, you should fight back. 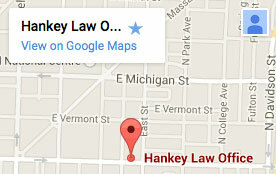 Contact a knowledgeable Indiana long-term disability attorney from Hankey Law Office at (800) 520-3633 today.